The RESILIO Series are a part of the Summer collection that will hit shops around Europe at the beginning of July. These products have been designed by Jose Palomero, the designer behind PalomitaDay. We asked him some questions about himself and the newest designs for Nomad Skateboards. Hi Jose, how old are you and where do you live? I’m 38 years old, I’m from Zaragoza and after living a while in Barcelona I ended up in Paris, already since 9 years. How many years have you been designing and how did you start? I come from a family with various artists, so in some way I´ve always been in touch with this world. My first real contact with graphic design actually happened via skateboarding. While studying in an art school I was being sponsored by a Dutch team. At some point I was thinking that it would be cool to design my own T-shirts and decks, and I became interested in various designing tools, typography, and communication, all with the ambition to start a brand. During this time there were no brands in Spain and very few in Europe. While I was orientating more towards fine art, Ivan (founder of Nomad) managed with a lot of effort to create this crazy thing called Nomad Skateboards that is now a reality. I am really proud to have it seen growing since the beginning. You’re from Spain, but living in Paris. How did you end up there? After ending my studies in fine arts I started developing myself as graphic designer. I started with customers in Barcelona and Zaragoza, and thanks to my ex-girlfriend, who is French; I started getting more and more professional contacts in Paris. So in the end I decided to make the move. Now I’m living here with my wife and two sons. Besides graphic design, do you have another job? What is your profession? Teaching is one of my main interests. Transferring my knowledge and ideas help others to grow and at the same time it gives me a kind of certainty. Besides having my studio I have been design teacher at LISAA School of Art & Design, and after almost 3 years I am the creative director of the school. My work consists of brand development and adaptation to all kinds of supports. These past years we have created a new image, from the company logo to the interior of the 7 different schools in France. In collaboration with another agency we also developed a website that got an honorable mention at the Webby Awards of this year. How do you normally start with a design? Where do you find the inspiration and concepts? Picasso said that the inspiration always comes while working. I normally start sketching in some kind of automatic way, and the ideas start flowing bit by bit. My design style tends towards geometrics and “Raw Art”, two totally different worlds and it happens a lot that I end up in between the two of them. I’m inspired by everything that surrounds me, in my case nature, walking down the street, traveling, and art in general, and above all the conversations with my eldest son. 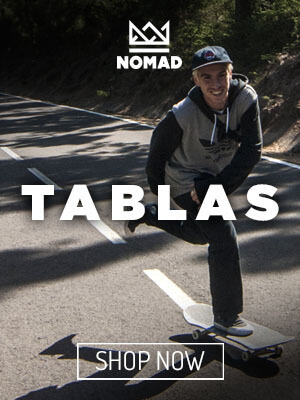 How do you know Nomad Skateboards and have you done more work for the brand? As mentioned, Nomad was a fantastic delirium that Ivan managed to launch. I’ve been friends with Ivan since forever, and in the beginning of Nomad I realized the brand’s identity and the designs for the first collection. Back then I was still young and I had no idea what I was doing! Later on I collaborated with Nomad each time when it came up. 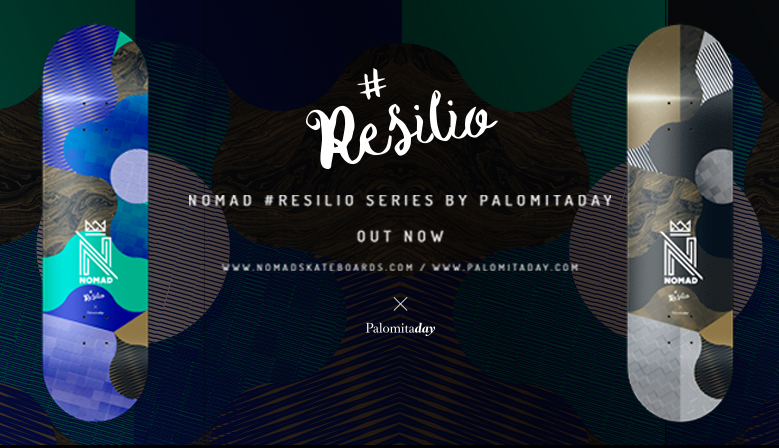 For the Resilio serie of Nomad’s newest collection, how did you start? I’ve been interested for a while in Japanese Marbling, “suminagashi” as they say in Japan. It’s a technique that is used a lot in binding and it imitates the veins in marble. It consists of water painting with different compounds that repel and in some manner find their own way. It’s something unpredictable but with a lot of practice you can learn to control it. I liked this idea of adaptation and the raw beauty, just like water, which basically is resilience. 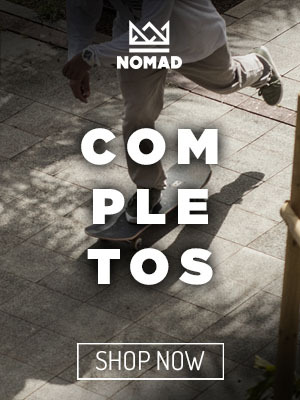 I think that Nomad Skateboards has gone through a similar path, knowing how to adapt to the circumstances to be resurging with more strength. Did you get help from other persons for the designs and their concept? Everything around me helps, especially my friends and family, but when I design I need to isolate myself from the world. The concept of resilience was already prepared by Nomad for a while with the whole idea of “Rebirth”, and I thought it was the perfect moment to give the concept a touch of my own. The work turned out great! The designs are amazing and they will soon be available in shops all over Europe. Is there anyone you would like to thank? I want to thank my family for their continuing support, especially my sons for being a guide for me on a daily basis. My friends for being another part of my family, and everyone who has taught me to grow and to be happy even when the wind comes from the opposite direction #Resilio! Previous Previous post: Make Skate Olympic! Or not?